The matryoshka doll is known for her chubby and cheerful cheeks, her perfectly shaped and smiling lips, and her big and bright eyes. She almost always wears a traditional Russian scarf or shawl around her head, neck, and/or shoulders. She holds at least two more smaller and similar matryoshki inside of her. She is famous. She is Mother Russia. But what about the men? They can be hard to find, but here are some manly matryoshkas for you! 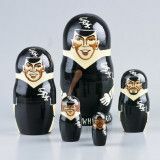 Sports-themed nesting dolls do not have to be male, but usually top male athletes are featured on these sporty nesting dolls. We all know that Santa Clause is a man… as well as the Snowman. We have more traditional (female) nesting dolls with images of Santa Clause and the Snowman, and we also have some more modern nesting dolls that are actually Santa and Snowman. We have some famous male nesting dolls, like Michael Jackson, Muhammid Ali, and Elvis. 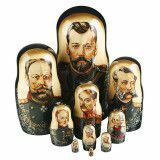 Browse through our large collection of nesting dolls! 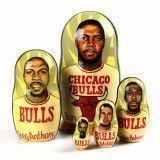 Do you have a matryoshka man in your nesting doll collection yet? Lindsey Mae is freelance artist who enjoys writing posts for Arina Anashkina and The Russian Store.